I have seen a lot of strange things come out of Japan and hit the gadget market. A lot of the weird stuff has to do with cats. I blame that on Hello Kitty mostly. A new gadget has surfaced for the computer user that gets a cold mousing hand. It looks like a cats head too. 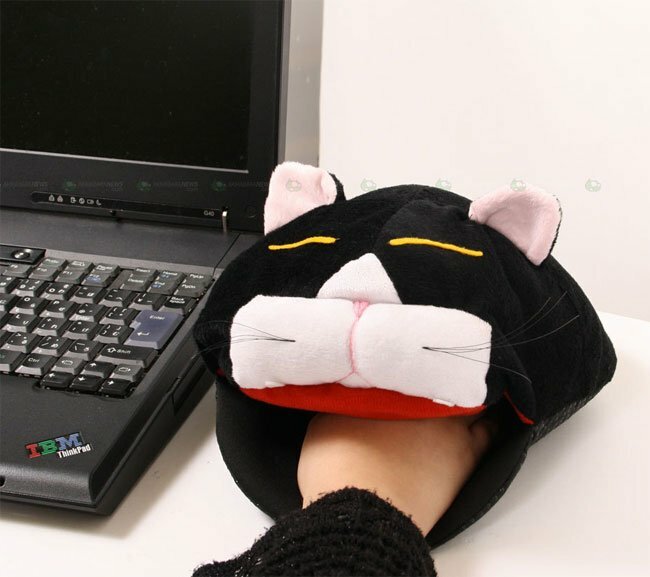 You put your hand inside the cat’s mouth to grab your mouse and control the computer. It has a USB powered heater as well to keep you nice and toasty while you work. The cat pad is 234 mm x 260 mm x 110 mm (9.21 in x 10.24 in x 4.33 in) and 95 g (3.35 oz). I’m not sure how much this thing sells for, but I am pretty sure it’s more than the thing is worth.